Located in the heart of Augusta, the Senator Inn & Spa has been voted one of the area’s Best Augusta Maine Hotels for nearly 20 years. Whether you travel for business or pleasure, the Senator Inn & Spa offers you some of the finest accommodations in Maine…. Our staff has over 50 years of combined wedding and event experience and looks forward to assisting you with planning the event of your dreams. 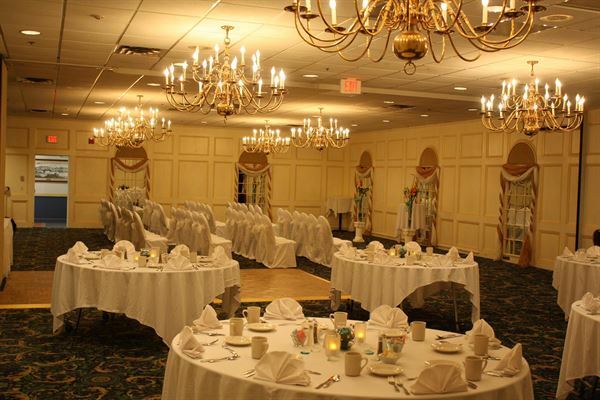 Our ballroom can accommodate gatherings from a small intimate affair, up to a larger reception of 170 guests. We offer a build your own dream wedding a la carte menu or we can create a package based on your individual needs. Ballroom Rental Includes: • White Linen & White Lace Skirting • Complimentary Overnight Reservations for the Bride & Groom (with 100+ guests at your reception) • Courtesy room Block of (10 or more rooms) for your Friends and Family • Deluxe Continental Breakfast Buffet in Cloud 9 for overnight guests • Referrals of Professional Wedding Vendors, Photographers, D.J. Florist, Chair Covers, etc. • Professional on-site Wedding Specialist • Placement of your Favors, Place cards, Centerpieces etc. • 5 hour Reception • Bar Service and Set up • Dance Floor Set up There will be a room charge of $1,000.00 for up to 5 hours, to include the above mentioned amenities. Receptions that exceed five hours will be subject to a $110.00 fee for the additional time, however bar service may not exceed 5 hours for any event. All food and beverage will be provided by the hotel and may not be brought in from an outside source. These three convenient rooms work especially well for business functions such as meetings & seminars. They may be used individually or as one large room. Special Features: We are the area's favorite choice for groups from 6 to 256. We excel at guest service and expert planning advice. Our experienced professionals are pleased to assist. Service is important and food is a priority. Elegant Room with private entrance. Special Features: We excel at guest service and expert planning advice, and our experienced professionals are pleased to assist with any special arrangements, including lodging accommodations for group members. Features an antique oak back bar salvaged from a local soda fountain. Works well for intimate dining, receptions or small meetings. Also can be used as an auxiliary meet-and-greet reception area for guests in the State & Embassy Rooms. Atmosphere/Decor: Works well for intimate dining, receptions or small meetings. Also can be used as an auxiliary meet-and-greet reception area for guests in the State & Embassy Rooms. Special Features: Features an antique oak back bar salvaged from a local soda fountain. A very elegant option for small executive gatherings. This exclusive boardroom features a conference table for 6 to 8 guests, a private restroom & adjoining guestroom suite. Elegant room that can be used singularly or combined with the Embassy Room for maximim capacity. Each room offers convenient parking, a private entrance and handicap accessibility. Atmosphere/Decor: We are the area's favorite choice for groups from 6 to 256. We excel at guest service and expert planning advice. Our experienced professionals are pleased to assist. Service is important and food is a priority.